The Celebration VI MINI Slave I is a MINI set released on August 23, 2012 during the first day of the Star Wars event, Celebration VI. The set features a MINI model of Boba Fett's Slave I, and has a light grey, green and brown colour scheme, with tan wings. The wings have the ability to move up and down, and the cockpit can also fold up to seat a minifigure. 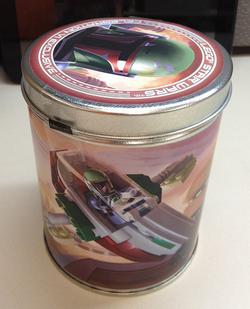 The set was released in a tin depicting the Slave I and Boba Fett is various positions, with Bespin in the background. It also includes Boba Fett minifigure exclusive to this set, which uses the leg, torso and helmet pieces of the version of Boba Fett included in the set 9496 Skiff, but uses the head piece commonly found on Stormtroopers and other Imperials in 2012, featuring a flesh-colored face printed onto a black piece. This minifigure does not come with any accessories other than the helmet, but a circular plate 4 studs wide is included as a stand for Fett. One thousand of these sets were released in total, with 250 being sold every day during Celebration VI. The Slave I was a Firespray-31-class patrol and attack craft which was stolen by Jango Fett, who later outfitted the ship with several concealed weapons systems. Jango's son Boba acquired this ship some time after his father's death, and used it several times throughout his bounty hunting career. One of these missions involved using the Slave I to transport a carbonite-encased Han Solo from Cloud City to Jabba the Hutt's Palace on Tatooine. The Boba Fett minifigure that is included in this promotional set uses the same head as the 2012 stormtrooper minifigure. The Boba Fett minifigure included does not have a shoulder pauldron or a jetpack like the past two variants. Facts about "Celebration VI MINI Slave I"